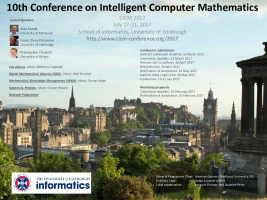 Mathematical Knowledge Management is an interdisciplinary field of research in the intersection of mathematics, computer science, library science, and scientific publishing. The objective of MKM is to develop new and better ways of managing sophisticated mathematical knowledge, based on innovative technology of computer science, the internet, and intelligent knowledge processing. librarians and mathematicians who catalog and organize mathematical knowledge. The interests of MKM overlap with those of other CICM tracks, but all tracks are reviewed and published together. If in doubt, authors may contact the program chairs to decide which track to submit to.